These are a selection of interesting public relations (PR) led travel stories that appeared in the travel press in the past few days – good, bag and ugly. The Maldives will be thinking long and hard about future Twitter campaigns after their PR company’s efforts to get posts about the holiday destination trending on Twitter. The campaign, which uses the hashtag #sunnysideoflife, was latched on to by critics of the Maldives’ military rulers who posted comments and links to information about the suffering of ordinary citizens, using the same hashtag. The issue was compounded when the Guardian picked up on the comments and published their own article about the backlash to the Twitter campaign. The negative responses helped #SunnySideofLife trend, but probably not with the message they were hoping to convey. Virgin Atlantic launched a new route to Mexico with a star-studded launch party leading to massive coverage on mirror.co.uk, which combines text, photos and a two-minute video. Outstanding PR result that an advertiser would be proud of! The Virgin PR team has been working overtime with several other ideas securing outstanding coverage in the travel press. 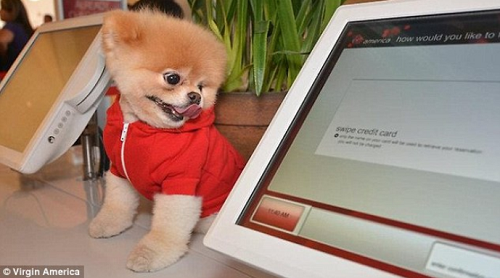 The DailyMail.co.uk features two Virgin stories on its travel homepage – Virgin America picked Boo – the cutest dog in the world to be the airline’s ambassador. Virgin has added pictures to its own Facebook page of Boo patrolling San Francisco airport to meet and greet guests – 5,000 likes have already been received. They obviously hope that Boo’s own legion of fans, including 5 million Facebook followers, will help the campaign go viral. The very cynical might think that the Daily Mail is trying to cash in on Boo’s popularity and fan base too. Top marks for online coverage though, the campaign has enjoyed stacks of coverage – the power of a cute picture! And Richard Branson has kept the Virgin PR juggernaut rolling by declaring his kids will join him to be among the first passengers on the Virgin Galactic space flight which launches next year – garnering press coverage and heading off any negative stories about safety before they get going. Butlins was another company to make use of video on the Mirror website, to launch their newest Wave Hotel in Bognor Regis. The Mirror’s feature includes a 20-min video about the new launch, which uses the format of a panel show with celebrity guests to introduce viewers to the new accommodation. The major launch was also covered by nationals including The People and Daily Mail, who sent travel journos along to cover the updating of a traditional favourite event in depth. Gatwick Airport has identified a new type of traveller – the OAT (stands for Old Age Traveller). The airport has launched a poll to find Britain’s Oldest Traveller, with the prize of return flights to Vegas. This nicely targeted angle has helped the PR team pick up coverage across an array of websites targeted at the grey market, including specialist sites such as sixtyplussurfers.com and maturetimes.com, national press including dailymail.co.uk and dailymirror.co.uk, plus blogs such as airport-parking.com and easybus.com. Great coverage already, and more will follow when the results are announced. Wild Comfort scored coverage in several titles, including The Sun, with their idea of mobile camping sites. They’ve used the Secret Escapes trend of only telling people where they’re going once their booking is made, and transferred it to the camping sector with luxury tents that have posh rugs, sofas and fridges that can be stocked on arrival. A great PR idea, but is there enough benefit for campers to get them booking? The hotel model works because customers save money because they are filling up capacity that has not yet been filled. The camping version has prices from £650 – a tricky sell in the UK at the moment?